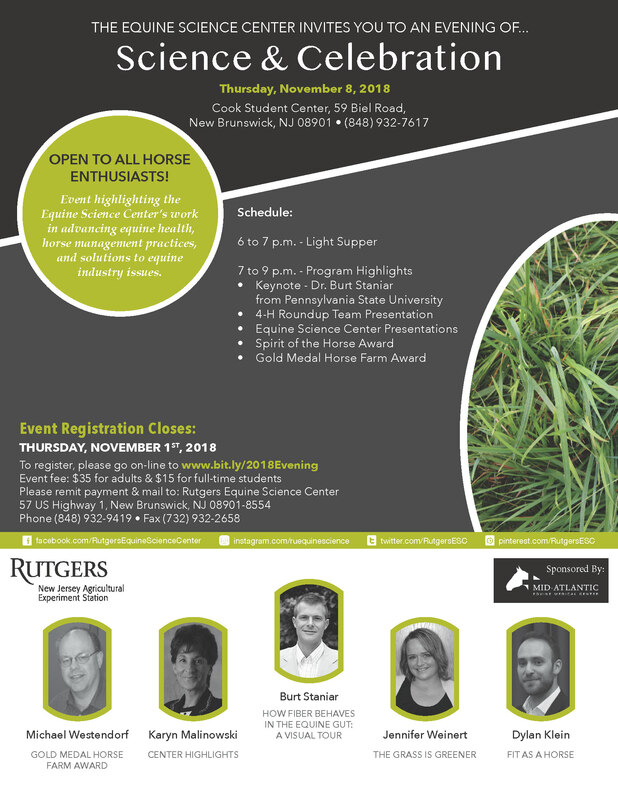 New Brunswick, N.J. – The Rutgers Equine Science Center will host its 2018 “Evening of Science & Celebration” on Thursday, November 8 from 6:00 – 9:00 pm at the Cook Student Center in New Brunswick, NJ. The event is being sponsored by Mid-Atlantic Equine Medical Center. This year, Burt Staniar, Ph.D. will deliver the keynote presentation titled, “How Fiber Behaves in the Equine Gut: A Visual Tour”. Dr. Staniar is an Associate Professor of Equine Science in the Animal Science Department at Pennsylvania State University. His research focuses on equine nutrition, pasture research, and gastrointestinal health. An “Evening of Science & Celebration” will begin promptly with dinner at 6:00 pm. After dinner, Brittany Smith a New Jersey 4-H Roundup member, and Rutgers SEBS student, will present her public speaking presentation, “The Cold Never Bothered Me Anyway” on international horse racing in Switzerland on ice! The Center will present its annual Gold Medal Horse Farm award to John Crater & Mortonhouse Farm in Long Valley, NJ. The award, part of the New Jersey Equine Environmental Stewardship Program, gives recognition to outstanding equine farms for their dedication to environmental sustainability and management. It also underscores the efforts of the New Jersey equine industry to maintain the beauty of the Garden State. The program is a collaborative initiative by the New Jersey Agricultural Experiment Station at Rutgers University, the Rutgers Equine Science Center, and the New Jersey Department of Agriculture. The event requires registration that can be made online at: www.bit.ly/2018Evening. The fee for the event, which includes dinner, is $35 for adults and $15 for full-time students.